We are delighted to have award winning Yuin/Monaro woman Dawn Mongta exhibiting her traditional and contemporary natural fibre works on Saturday at the Eden Fishermen’s Recreation Club from 11:30am-4:30pm. Dawn will have natural fibre weaving of baskets, mats, traps for gathering fish, eel, prawns and lobsters, along with family shellwork and crafts, featuring a strong “water and bush” theme. 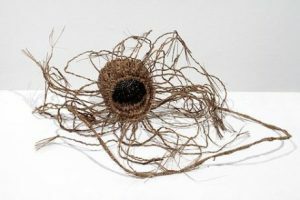 In 2006 her weaving work, “Dawnies Personal Belongings” gained Commendation recognition in the National Gallery of Victorian Acquisitive Prize category in the Victorian Indigenous Arts Awards.